"An adventure as big as life itself." Big Fish is a fantasy adventure film directed by Tim Burton. Big Fish follows the last few days of the life of a father as he tells his daughter-in-law the half-fable half-true story of his life. The majority of Big Fish is a sequence of flashbacks narrated by Albert Finney, who plays the father named Edward Bloom. Bloom’s son Will is uninterested in hearing his father’s fantastical stories, which he has heard too many times during his life to believe or even enjoy even one last time. The first story Bloom tells his daughter-in-law Josephine is the story of his childhood. Bloom tells about how when he was young his friends dared him to go up to the house of a witch living in the woods and knock on her door. The rumor around town was if you looked into the witches eyes, you would see how you were going to die. Bloom was brave and went up to see his fate in the eyes of the witch. By knowing exactly when he was fated to die, Bloom says he was given the confidence to pursue life unabashed and to take risks without any fear of death. Bloom then tells Josephine the stories of the first time he met Will’s mother, the odd jobs he worked before he became a traveling salesman, the odd towns and people he met on the road as a traveling salesman, his proposal to Will’s mother, his time in the Army, and many more outrageous and fantastic stories of his life, before he tells her the final story of the big fish. In the final scene, the turnout at his father’s funeral proves to Will whether or not his father was telling the truth about his life in the stories he perfected through retelling for so many years. 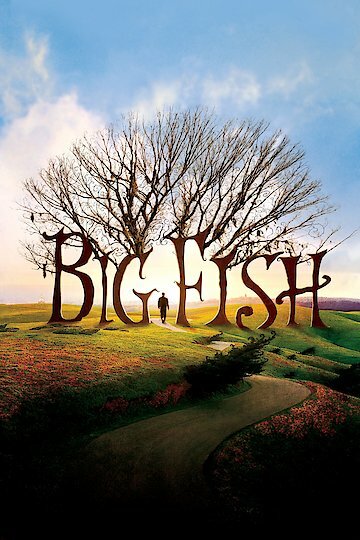 Big Fish was adapted from the short 1998 novel of the same name written by Daniel Wallace. Big Fish is currently available to watch and stream, download, buy on demand at Amazon Prime, HBO NOW, Amazon, Vudu, Google Play, iTunes, YouTube VOD online.